Shiny dog coat is a sign of a healthy dog. It tells us the dog is getting all the right nutrients he needs from his diet. While lacklustre coat can be a sign of some dog skin disorders, like skin infections or dog skin allergies. It is recommended to see a Vet about these types of dog skin problems. The following tips can help you to restore lacklustre but healthy dog coat. Essential fatty acids are the key to healthy shiny dog coat. This is why good quality omega oil is the best skin and coat supplement for dogs. Omega 6 is the fundamental fatty acid for smooth and shiny dog coat. While omega 3 has powerful anti-inflammatory properties that help to relieve some common dog skin problems, like itchy skin, skin allergy, and other inflammatory skin diseases. So if your dog's coat looks worn-out, you may want to add fatty acids for dogs (omega oil for dogs) to his diet. This is especially valid for dogs on low quality commercial dog foods, improperly managed homemade diet, or on low-fat diet. These dogs may not get enough essential fatty acids from the diet to sustain healthy dog skin and coat. What's more, most dogs do not get the right ratio of omega 3 and 6 from their diet and therefore benefit from omega for dogs supplementation as well. Regular brushing stimulates the hair follicles and the skin. This increases the natural production of skin oils that make the canine coat shiny. You should also bathe your dog regularly, though not too often. It depends on your dog how often is often enough, but you want to keep the coat clean without stripping it of its essential natural oils. Always use mild moisturizing shampoo to reduce the risk of irritating the skin. We all know that oatmeal is good for us, but did you know oatmeal is also good for your dogs' skin? Oatmeal bath can help to reduce your dog's skin discomfort, by nourishing, moisturizing, and soothing dry skin. It also leaves an invisible protective coating on the dog's skin, protecting it from further itching. This is why many hypoallergenic dog shampoos include oatmeal as an ingredient. The oatmeal helps to prevent skin irritation and leave the coat soft and shiny. 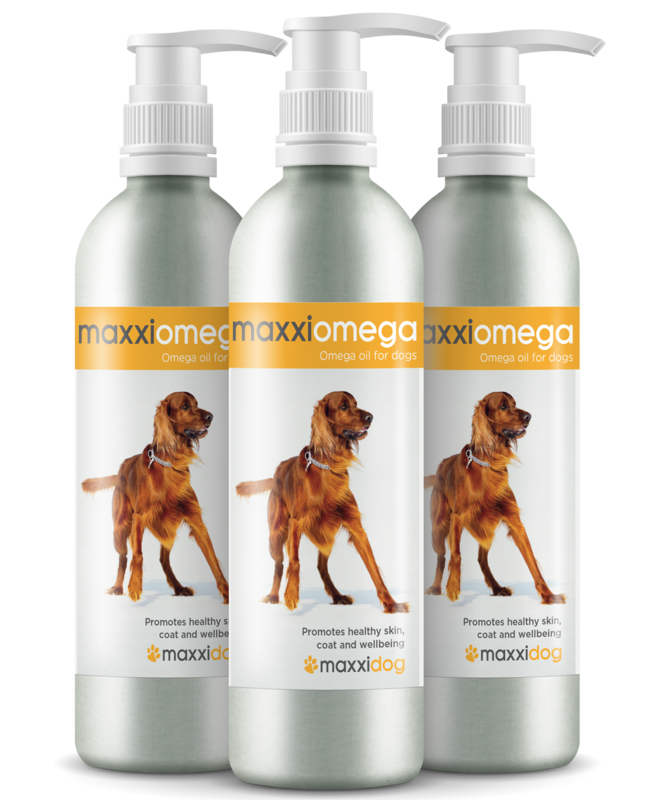 maxxiomega oil for dogs contains the right balance of fatty acids to help restore healthy shiny dog coat. Our four-legged customers love the taste and our two-legged customer love how their dogs look and feel.